I'm playing a game on a forum that involves guessing who posted. An American English speaker said that because the poster wrote "in one go" (meaning "in one sitting"), they were probably British or European as that's not an American expression. But the Oxford Learners Dictionaries' definition does not mention "in one go" being British English despite saying that several of the other expressions on that page are British. If there is a book I'm desperate to read then when I eventually do I have to read it in one go. Sometimes this means staying up all night. 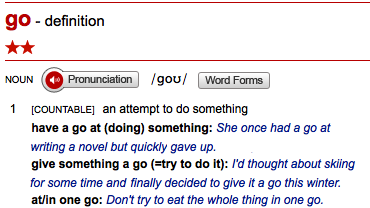 However, you Europeans don't seem to realize it, but "in one go" is not an American expression, unless anyone has picked that up from being online, but it's not native to here. I only heard the term "on the go" (as in, "how many games you have on the go") within about the last year, and it was Brits using the term. I use the term "on the go" meaning on the run, like busy, busy. Is this true? Is it an unusual expression in American English? If so, what phrase would you use instead? I've wrestled with this one, mostly because of the way you've titled your question. Take, for example, nappies (which we call diapers in the U.S.). I would consider nappies to be UK English; I rarely hear the word, and, more importantly, when I do, I almost have to translate it in my mind. As for in one go, I looked at a lot of blogs and message boards, and, indeed, when I managed to find this expression on the internet, it was almost invariably traced to a U.K. speaker1. But, for some reason, it doesn't sound chiefly British to me. It's immediately understandable. I got this done in one go doesn't sound like something I would never say, (unlike, I need to go change a nappy). So, getting back to your title, I find myself wondering: What makes something "British English" vs. "just English"? If I had to make a ruling, I'd say, no, "in one go" is not "British English", and I'll count on Macmillan to back me up. So, the Macmillan editors, at least, don't seem to think the phrase is British enough to be tagged BRITISH. would be what you called "just English." Based on my usage searches, though, I think it's a borderline call, so I wouldn't vehemently argue against Codeswitcher's stance. In the latter case, then you'd be doing yourself a favour to have the whole lot done in one go. The speaker is a self-identified electrician from Thornbury, which I assume is a U.K. Thornbury, judging by the way favour is spelled. SO patients like me are looking to neuroscience research to lend nature a helping hand. And remarkably, some researchers foresee the possibility that one day in the not too distant future they may be able to develop drugs to target these rogue proteins, potentially combating several neurological diseases in one go. Edit: So maybe the author of that particular article was educated in the UK. It was the first of thousands of hits on the New York Times website alone. Yes, I consider it unusual in American English, though perfectly intelligible and not unheard of. Instead, I would say "all at once", or as in your example, "in one sitting". "In one go" is British English that has crossed the pond (Atlantic Ocean) to become part of some American English speakers repository of expressions. Not the answer you're looking for? Browse other questions tagged phrases american-english or ask your own question. Are British words jarring in US English? What is the American English equivalent for the saying “beaten road is the safest”? Best decision I/I've ever made— difference? lecture theater- an American expression?